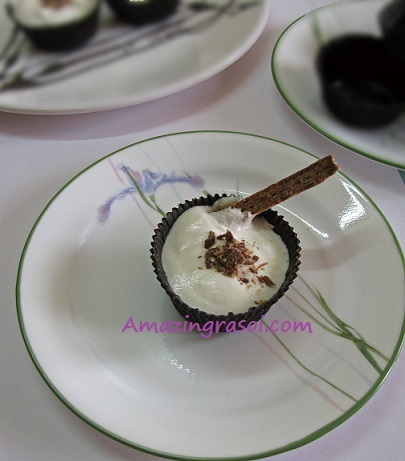 Serving desserts in edible Chocolate Cup is interesting and perfect for chocolate lovers. You can fill these cup with ice cream, mousse or any such desserts. It is quite innovative way of serving desserts. Pour the heavy cream into a large bowl. Take ice cubes in large bowl and place cream bowl in large bowl. Add the sugar, and vanilla extract. Whip the mixture together until get soft peaks(as shown in pic). Let the whipped cream cool in the fridge for about 15-20 mins. Melt the dark chocolate in microwave and whisk it well. Take a muffin liner and pore 1 -2 tbsp of melted chocolate and coat the sides of liner with chocolate using brush. Freeze these liner for 5-10 mins. Take out these liner from freezer and again coat these liner with melted chocolate. Freeze it again for another 5-10 mins. Take out these liner from freezer and peel the outer layer i.e muffin liner as shown in pic). Take a choco cup and fill with whipped cream. Garnish with crushed chocolate and serve chilled. 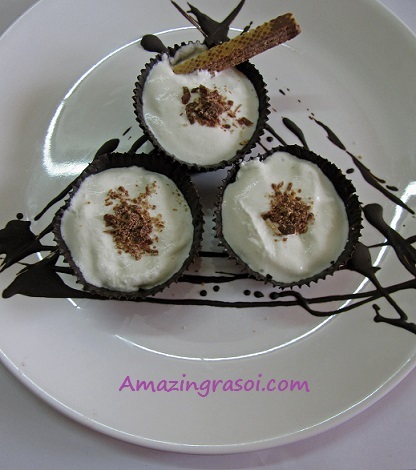 Any thing can be served in these choco cup like mousse, Ice cream etc. Can flavor this whipped cream with chocolate to make it more chocolaty.